Welcome to THE VETTE NET. Nationwide Corvette Brokerate Network a place where enthusiasts interact when ready to buy or sell their dream cars. 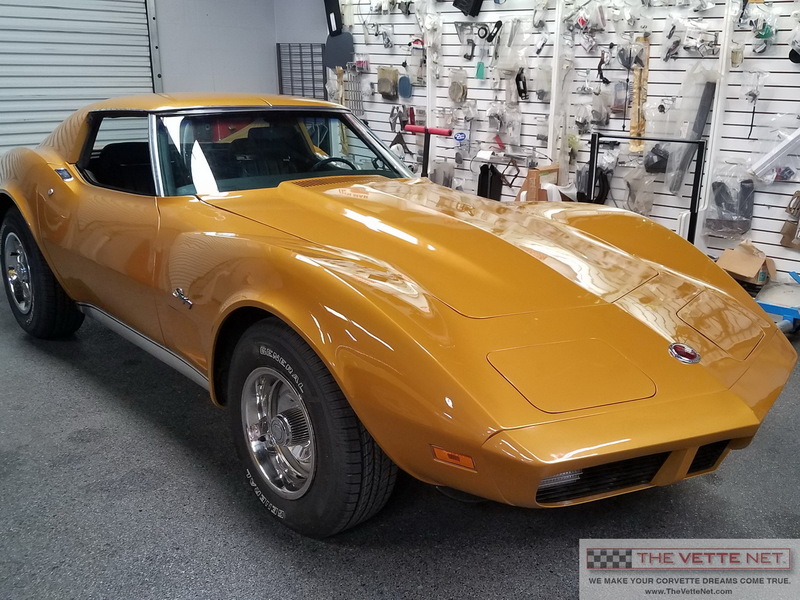 Our offer today is a beautiful 1973 Coupe in a rare color, Metallic Yellow which came from the factory with the desirable optional L82 small block. Times were hard then for sports cars... Insurance regulations required the elimination of the expensive-to-replace Chrome bumpers. The 1973 year has a unique one-off distinction of having Chrome bumpers only on the rear, the next model, 1974 completely losing all of them, thus ending the era of the "Bumper Cars". In any case, this model just received a fresh high quality paint job in the original color, new leather interior, new tires... Car was completely evaluated : AC blows cold, brakes are new. All gauges work, car runs and drives amazingly. Miles show 83K which are very likely original since previous owner had it for a long time. There is no documentation, however. Located in FLORIDA, we can arrange delivery nationwide and all over the world. Corvette trades are considered, also, financing is available. Enjoy the walk-around video below.